I'm superexcited to be an organizer for my first swap in the New England area. 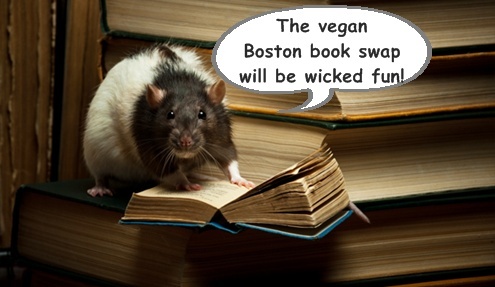 My dear friend, journalist/ activist Jamie Hagen and I are hosting a Vegan & Animal Right Book Swap to Benefit Vine Sanctuary in Boston. Open to all regardless of age, gender, or diet. Please join us for an evening swap of inspiring vegan cookbooks, theory books, how-to dvds, and all other media related to vegetarianism and animal rights. Bring up to ten items to swap or just come mingle! There will be a raffle in support of VINE animal sanctuary in Vermont with awesome prizes donated by Sudo Shoes, Two Trick Pony, Life Alive, Veggie Galaxy, Kristin Crane, and Compassion Company. I'll be baking some brownies and other treats to sell in support of the sanctuary as well. A guest speaker from The Humane League will talk about their Boston campaigns. Follow #bostonbookswap on Twitter and Instagram for updates. RSVP on Facebook so we don't think no one is coming and get all emo. Hope you will have a successful event, and thank you for all you are doing! thank YOU for sponsoring a prize! You are awesome! I can't wait to go to Boston for some of your kraut!